Israel usually is always the one to bend in gaining peace with her neighbors. Even after the 1967 Six Day War when all the Arab nations attacked Israel but lost the battle, the Arabs decided to attack Israel again in 1973 on Yom Kippur and lost again. This attack by an Arab coalition of states was led by Egypt and Syria starting on October 6th and lasting until the 25th. The Camp David Peace Accords were held starting on September 17, 1978. "They were the result of 14 months of diplomatic efforts by Egypt, Israel, and the United States that began after Jimmy Carter became President." Sadat visited Israel 10 days after telling his government he was going to visit Israel on November 9, 1977. and made peace this time with Israelis admiring him greatly for his 3 day visit including addressing the Knesset. 16 months after his visit, Egypt was the first to make peace with Israel out of all the Arab nations that were defiant in its creation by signing a mutual recognition peace treaty with Israel on March 26, 1979 in Washington DC. The Camp David Accords also prompted the disintegration of a united Arab front in opposition to Israel. "As part of the agreement, the U.S. began economic and military aid to Egypt, and political backing for its subsequent governments. From the Camp David peace accords in 1978 until 2000, the United States has subsidized Egypt's armed forces with over $38 billion worth of aid. Egypt receives about $1.3 billion annually." Since then they are receiving 1.5 billion each year but the amount is now being reconsidered because of the disturbance of a possible coup in Egypt where the Muslim Brotherhood had been in power. The people have overturned that and have taken charge with the more secular military. "Between 1948 and 2011, the United States has given Egypt about $71.6 billion in bilateral military and economic aid." Israel gave back the Sinai, taken in 1967. "Begin remained determined to continue the peace process. In the end, he agreed to return to Egypt the strategically critical Sinai — 91 percent of the territory won by Israel during the Six-Day War — in exchange for Sadat's promise to make peace." For his efforts, Sadat was assassinated by a Muslim Brotherhood army officer on October 6, 1981. He was the son of an Egyptian father and Sudanese Nubian mother and had 13 brothers and sisters. Sadat had been born on December 25, 1918 right after WWI had ended on November 11th. 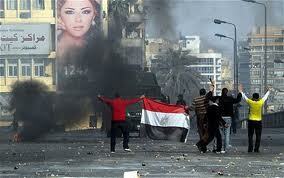 Egypt is still battling against the Muslim Brotherhood. 278 people have been killed since Wednesday as riot police cleared out 2 camps of them. The interim Vice President, Mohamed El Baradei has resigned. Israel, with Egypt's military cooperation, was able to use a drone and hit 5 terrorists connected to Al Qaeda about to shoot into Israel. This cooperation has taken place now with the Muslim Brotherhood not in power. Egypt is also taking the credit for doing so. Perhaps it was their combined efforts. The United States is complaining that putting an end to the rioting must be done differently than brute force. "The White House condemned the violence and said the United States “strongly opposed” the imposition of a state of emergency by the military-backed government." As I see it, the violence is coming from the violent reaction of the Muslim Brotherhood in reaction to Morsi being deposed. They are not about to be agreeable for the good of the state but want their power back. Outside of the USA, force is usually met with force. However, the USA is giving a quarter billion more dollars to Syria who is also in turmoil with a civil war between the government and the people. Has the United States considered withdrawing this aid from a despicable despot? Assad is no sweetheart. He had been financed by the Russians. It's unfortunate that the Muslim Brotherhood gained power in the first place. Now that error has been rectified, but is causing something akin to a Civil War that has also happened in Syria. Whereas it looks like Assad's government might be winning, right now it looks like the Egyptian military is winning with a quick put down. Only time will tell.